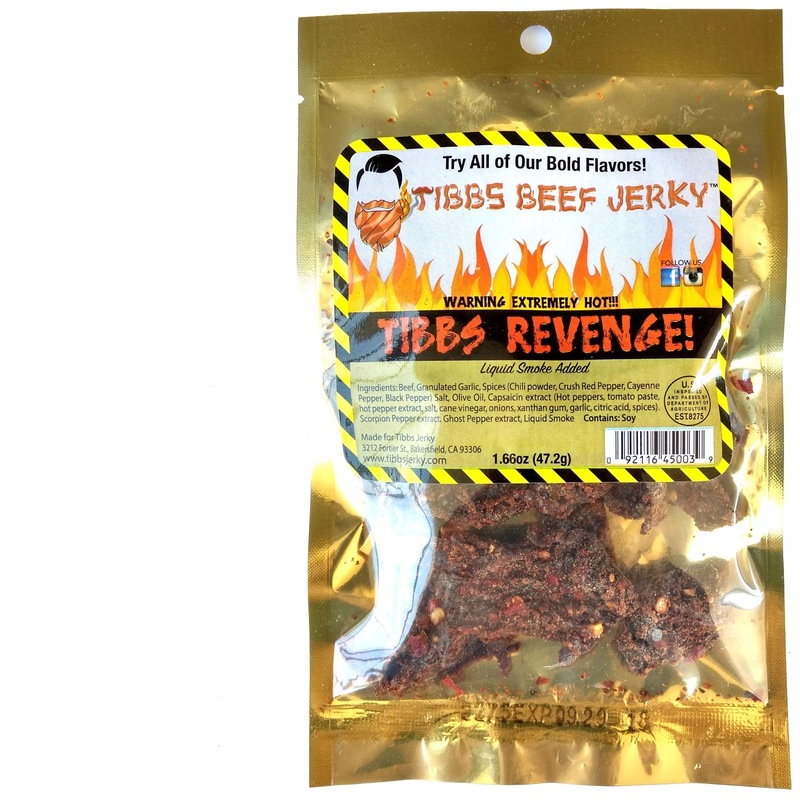 This "Tibbs Revenge" is described by the brand as, "World's Hottest Lab Tested", being made from a combination of Carolina Reaper, Trinidad Scorpion, and Ghost Pepper chiles. According to Tibbs, this jerky has been measured on Scoville Scale between 1.92 to 1.98 million units. For comparison purposes, the habanero pepper is about 1.0 million units, while the Carolina Reaper is about 2.0 million. The first flavors to come on is a pungent chile pepper, perhaps the Trinidad Scorpion, followed by a light salt and garlic. The burn builds up quick. The chewing brings on some of the natural meat flavors, while the heat continues to attack. For being marketing as the "World's Hottest Lab Tested", I think it could very well be. This jerky is painfully hot! Eyes water up immediately, sweat pours from the scalp, and the tongue seems too traumatized to want to do anything else. After a few pieces of this stuff, the endorphin rush comes on strong, and I feel myself wired up and electrified. 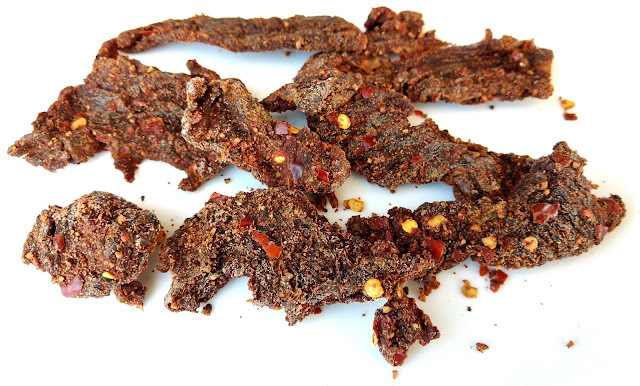 I've reviewed many extremely hot jerky brands over the years, and this may very well be the hottest. Otherwise, the primary taste profile is a lightly salted, light garlic, natural meat, with a strong Trinidad Scorpion flavor, and heaps, and heaps, of burn. The meat consistency is largely dry, yet still soft and flexible. It tends to be chewy, but because it's so incredibly hot, you end up chomping this quickly just to get it down. Yet, it's quite meaty and nearly steak-like in texture. 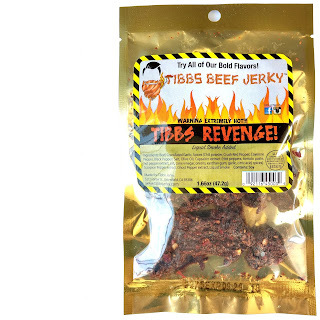 This Tibbs Revenge from Tibbs Beef Jerky is all about the heat and it pulls no punches, walloping you with such a blistering tongue torching one has to wonder the kind of masochists out there demanding such palate incinerating chew. 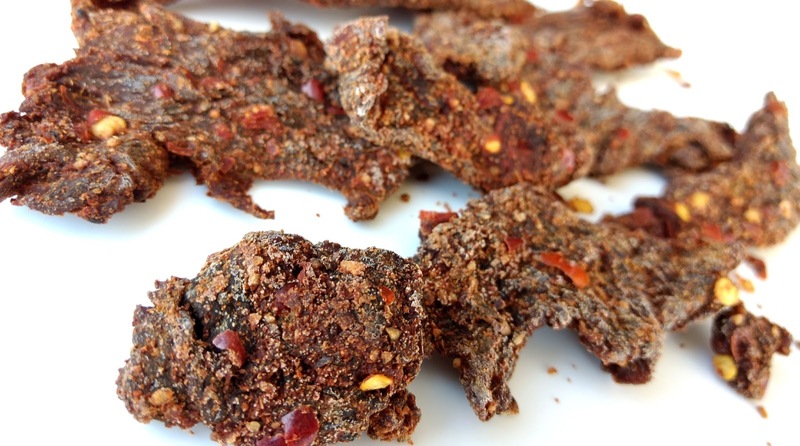 But this jerky offers some good flavor too. I love the pungent, earthy Trinidad Scorpion chile pepper flavor that reeks out with each chomp, and I found the light garlic and salt to beckon you into eating more. Even the surge of endorphins rushing through my veins creates a lot of excitement. Better keep a gallon of ice cream handy, because if you're not ready for the Revenge, you'll be reaching for a spoon.